"Where is your castle, King of Time? Every good king has a castle!" The Rook #1 by Dark Horse Comics is another comic book that revives a long-lost character. Doing so brings with it a lot of pre-conceived notions about the character thanks to the character's previous run. Tapping into that character's mythology makes for a fun reboot. 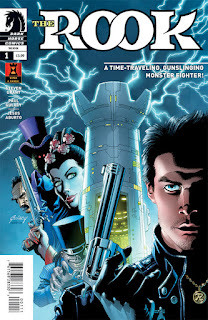 The issue is written by Steven Grant, illustrated by Paul Gulacy, colored by Jesus Alburto and lettered by Nate Piekos of BLAMBOT. Seeking his roots, a time traveling adventurer stumbles across history’s darkest secret: an immortal genius who has terrorized and shaped human culture since the dawn of man. Though seriously outgunned, he begins a lone guerrilla war across time, in pasts unheard of and futures undreamed of, to free humanity from the immortal’s unending grip. The narrative in The Rook #1 is told primarily through the point of view of Restin Dane, characterized as a scientist fervently trying to solve the time travel puzzle. Grant uses him as an effective foil for the Rook, as well as a catalyst for presumably the remainder of the series. There are individuals who are seeking vengeance against the Rook, yet why they're tracking him through space and time is a little murky. It seems as if Grant is giving them a motivation of power, but their relationship to Rook (and Restin to some extent) isn't exactly clear. There's also a really odd tie-in to a more famous work of science fiction by a noted author, tapping into a certain zeitgeist typically affiliated with that author and genre. The characters and settings in The Rook #1 feel like a nod to older illustrative styles. The costume party setting works well for the events to unfold in the issue, as it provides those chasing the Rook something of an effective for their mission. There are some issues where faces appear slightly distorted, as if Gulacy and Alburto are trying to use shadows that instead cover up some details. Panel layouts for the most part are laid out in a grid and relatively simple in presentation, accented mostly by blackened gutters. The action sequences are illustrated in a way that feels as if they're caught somewhere between static and dynamic, somewhat hindering some panels from fully feeling kinetic. The Rook #1 is rebooting a character and brings with it all the requisite baggage. Much of the time traveling in the issue feels a little helter skelter throughout, even jarring the reader at points. Grant's story has a lot going on in it and he clearly has a grander plan in mind, but that plan is a little murky right now. 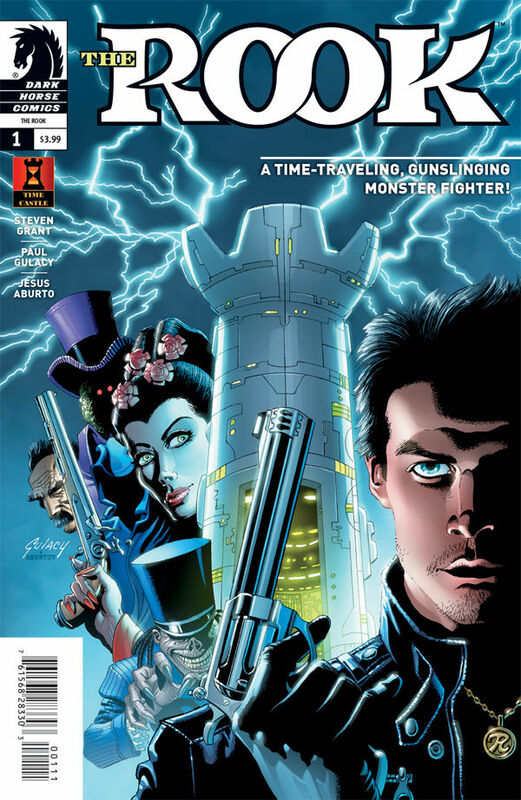 Gulacy's illustrations attempt to recreate the atmosphere from the original run, tapping into a nostalgia in terms of the character designs and interactions. The Rook #1 is an interesting approach to bringing new lie to an old character. The Rook #1 is in stores now.